This semi-limited release (less than 6000 bottles) from Diageo’s Classic Malts lineup of 2010 is one of the few OBs of Auchroisk since the demise of their Singleton brand in 2000. It’s a Speyside distillery that doesn’t get much attention, as most of its output finds its way into such blends as J&B Rare and Johnnie Walker Red Label. It’s also a rather pricey bottle that I bought because it was on sale and because I knew it had a flavor profile I’d probably enjoy. Nose: Rich, thick, fresh, and elegant. Here’s where Auchroisk’s renowned water spring (Dorie’s Well) might play an important role. As powerful and fruity as it is clean and articulate. Vanilla, buttered popcorn, roasted nuts, and lots of canned cling peaches. Herbs and flowers come and go. Very little burn for a cask-strengther, and the only alcohol smell is a slight whiff of sherry. It’s a strong one better nosed neat; water brings out some bitter oak that doesn’t mingle well. Palate: The nose may work best neat, but you’ll want some water for sipping. It’s just a flaming fruit compote in pure form. With water, there’s a great deal going on: vanilla, caramel, roasted cinnamon-coated nuts, sherry, oranges, shortbread cookies, and a little hint of smoke. Nice oily coating on top of everything. A unique lineup of flavors with an interesting balance throughout. The finish is decent in terms of both length and flavors, but it’s disappointingly one-dimensional after such a multi-layered prelude. Most of the sweet flavors have vanished, save for some traces of caramel, with oak and nuts outshouting everything else. A few nit-picks keep this one out of the 90s. However, I’d say it’s a B-plus whisky (almost) worth the A-plus price tag. The best components are as unique as they are good, and I think most drinkers would appreciate Auchroisk 20 for its one-of-a-kindness. A little less than great, but delicious and interesting nonetheless. 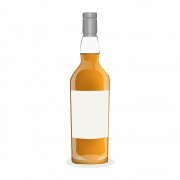 Duncan Taylor Auchroisk, 22 yo, 1988, bottled 2010 My first Auchoroisk!